[UPDATE Dec 17: Election Results] The incumbent Terry Lister [PLP] has retained his seat against newcomer Toni Spring [OBA]. The incumbent Terry Lister [PLP] is being challenged by the political newcomer Toni Spring from the OBA. In the 2007 General Election, Mr Lister won 60.96% [556-346] of the vote vs the UBP’s Alvin Wilson. In the 2003 General Election, Mr Lister won with 62% of the vote against Ted Gauntlett [UBP] who received 38%. 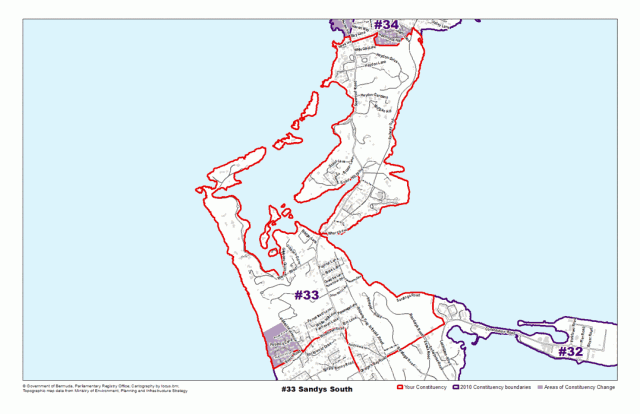 Areas the Sandys South constituency compromises of, or is located by, includes Sound View Road, Constitution Road, Middle Road, Woodlawn Road, Patience Avenue, Somerset Road as well as islands such as Gunpoint Island, Whale Island, Cathedral Island, and Bethell’s Island. Terry Lister, JP, MP has represented Constituency 33, Sandy’s South, since he was first elected to Parliament in 1998. His long and distinguished parliamentary career began when, in 1993, he was appointed PLP Senator and Opposition Spokesman on Finance, Tourism and Marine Services, Technology and Information, Works and Engineering, Parks and Housing. In the landmark year, 1998, when the PLP won its first majority at the polls, he successfully contested the seat in the Constituency #33, Sandy’s South and has been successful in retaining the seat in all general elections since then. His business and professional skills merited his appointment to the first PLP Cabinet as Minister of Development, Opportunity and Government Services. Since then has held a number of important portfolios which included Labor, Home Affairs and Public Safety – 2001-2003; Works and Engineering – 2003 – 2004; Education and Development – 2004 – 2006; Energy, Telecommunications and E-Commerce 2007-2009; Transport – 2010-2011. Within the PLP, he served as Campaign Chairman of the PLP’s Sandy’s Branch in the 1989 General Election and in 1993 as the Party’s National Campaign Co-Chairman. Mr. Lister was educated in Bermuda at the Southampton Glebe School and The Berkeley Institute. After studying at Trinity College School in Port Hope, Ontario, he became a Bermuda Government Scholar, completing his Bachelor of Commerce Degree at Queen’s University’s School of Business, Kingston, Ontario. At York University in Toronto, he graduated with a MBA Degree. Upon graduation he worked in Toronto for three years with the accounting firm PriceWaterhouse. During this period, he qualified as a Chartered Accountant. He returned to Bermuda in 1980 and in 1981 opened his own accountancy practice. In September 1982, he joined Deloitte and Touché as a full partner where he remained until 1998 when he retired to become a full time politician. His record of public service includes Chairmanship of the Berkeley Institute Board of Governors and the Berkeley Educational Society. Mr. Lister also served as Chairman of the Bermuda Debate Society and as a member of the 1985 Hurricane Emily Relief Committee. He was a member of the Board of the Atlantic School of Chartered Accountancy and President of the Council of the Institute of Chartered Accountants of Bermuda. He is a Life Trustee of the Bermuda Institute of Ocean Sciences. In 2005 Mr. Lister was recognized for his service to the Bermuda Accounting Profession and awarded an F.C.A. Educated at Oglethorpe University and then Brenau University where she received her teacher certification, Toni is currently a teacher at the Adult Education System where she works with both adult students as well as young men and women who may have dropped out of the public or private systems. In addition, Toni has taught at Northlands Secondary School and Sandys Secondary Middle School as well as schools in the Atlanta Georgia public system. As a member of the OBA Education Advisory Board, Toni has been instrumental in creating a new vision for our public school system.